Heat exchangers are important and expensive pieces of equipment that are used in a wide variety of industries. This course will enable you to improve your heat exchanger effectiveness and extend your equipment’s life span by teaching you the basic principles of fluid flow and heat transfer. You will also learn about the design and operation of shell and tube heat exchangers, as well as compact and air-cooled exchangers. The course will explain how to use the applicable API, TEMA, and ASME codes, standards, and recommended practices. Class discussions will cover fabrication; materials of construction; costs of tubular units, condensers, and reboilers; the effect and mitigation of fouling; and the causes and preventions of exchanger tube vibration and damage. You will study factors to consider when deciding between repairs and refurbishments of aging equipment, focusing on the most cost-effective options. This intensive and interactive course includes workshops that reinforce principles with practical worked examples. Explain the principles of heat transfer and fluid flow in heat exchangers. Apply good industry practices and supporting data. Optimize the design, performance and operation of modern heat exchangers. Understand the cause, effect, and mitigation of fouling. 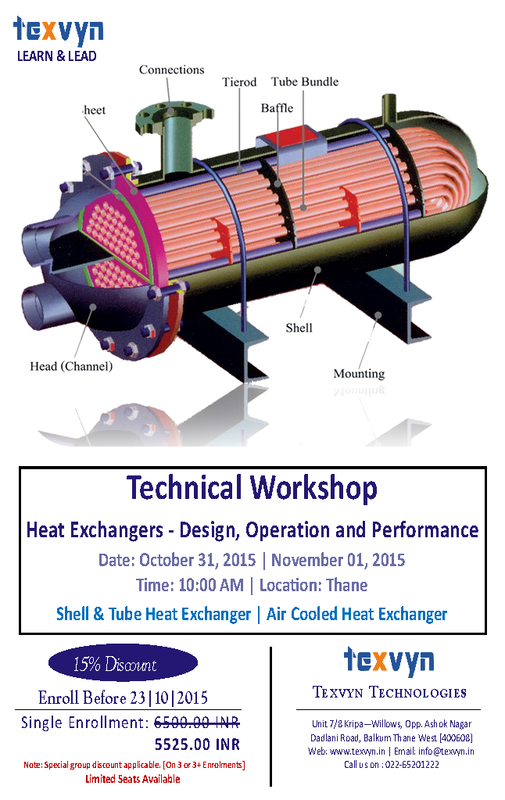 Classify various types of heat exchangers, their applications and recent technological advances. Develop thermal and mechanical designs. Determine rating by considering recommended practices, standards and codes. Prevent future problems and damage using vibration forcing mechanisms. Identify the causes of failure of your heat exchanges. Reduce expenses using a knowledge of fabrication, construction materials and costs. Process engineers and plant engineers. Mechanical engineers involved in design, operations, troubleshooting, and maintenance. Supervisors, technicians, and technologists in oil, chemical, power, and other industries who require a more extensive understanding of heat exchangers. Classification of shell & tube heat exchangers. Single phase shell & tube heat exchangers. Physical properties & heat release profiles. Fouling – Causes, consequences & mitigation. Heat exchanger troubleshooting & debottlenecking. Thermal design of S &T exchanger on HTRI (Example). Introduction to air-cooled heat exchanger. Thermal design of single phase & condensing air-cooled heat exchangers. Optimization of thermal design of air-cooled heat exchangers. Control of air-cooled heat exchanger. Operating problems in air-cooled heat exchanger. Special application of air-cooled heat exchanger. Those generally knowledgeable in the subject, will find this course to be a useful refresher. However, those unfamiliar with the subject can also attend, as no prior knowledge of heat transfer is required.